Sensei Luis Morales was born in 1958. As a child he was fascinated with the Martial Arts, spending many hours reading the various Martial Arts publications such as Black Belt Magazine and Karate Illustrated. His first real exposure to the Martial Arts came when he was only 8-9 years old. A family friend introduced him to a Ju-jutsu style called Miyama-Ryu. Not knowing that this was the path that The Most High has chosen for him, at the age of 12 years old he made the decision that would change his life, he began his formal training in Bu-jutsu. Sensei Morales has dedicated his life to the study of Okinawan Goju-Ryu Karate-jutsu, and due to his relentless pursuit has a profound knowledge of its Kata and its Bunkai (Applications). He is highly regarded for his advanced abilities in the ways of Martial Science, Tuidi-jutsu (Grab Hand Art) and Kyusho-jutsu (Vital/Pressure points Point Art) that are Sub Arts of Karate. Sensei Luis Morales is a professional Karate teacher, who has trained with the world's leading Goju-Ryu's masters; to name a few, he was a senior student of Master Teruo Chinen, Chief Instructor of Jundokan International, and also a student of Grandmaster Eiichi Miyazato 10th Dan, founder of the Jundokan Dojo and student of the founder of Goju-Ryu, Grandmaster Chojun Miyagi. Sensei Morales quest for knowledge kept him searching for other Goju-Ryu teachers. It was then he met the head master of International Kenshi-kai Organization Hanshi Tetsuhiro Hokama 10th Dan in Okinawan Goju-Ryu and Kobu-jutsu. Sensei Morales feels very fortunate to be under the tutelage of Grandmaster Hokama. He is truly a master of The Old Ways. ensei Morales has done seminars along side with many Martial Arts great such as Soke Lil John Davis of Kumite-ryu jujutsu, Professor James Muro of Hawaiian Kenpo and Danzan-ryu jujutsu, Guru Doug Pierre, Grandmaster Bill McCloud of Urban contemporary jujutsu, and Senor Master Rudy Tuiolosega of Limalama. His hands on approach make his seminar very popular and sought after. Hanshi grade in Okinawa Goju-Ryu Karate and Kobu-jutsu. Certified GrandMaster rank in Torite-jutsu 7th Dan under Grandmaster Tom Muncy 10th Dan a founder of the Dragon Society International. 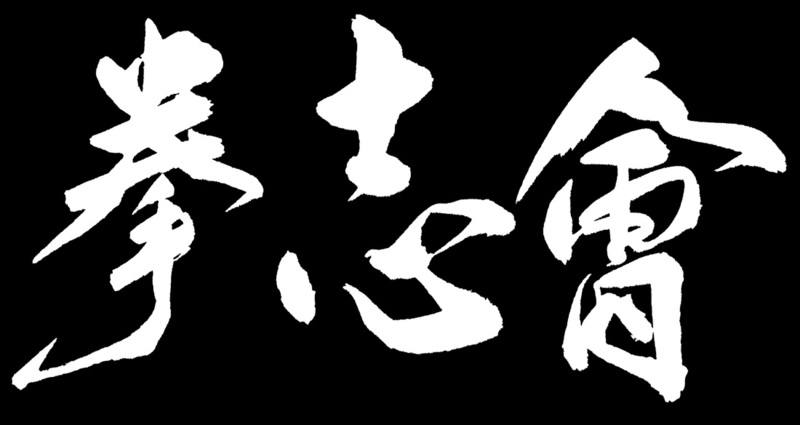 Kaicho of The Kokusai Bugaku Renmei (International Martial Science Federation). Living by his motto ?Always a Student? Sensei Morales continues to learn and research the Martial Ways; and he is currently training in other Budo Arts. 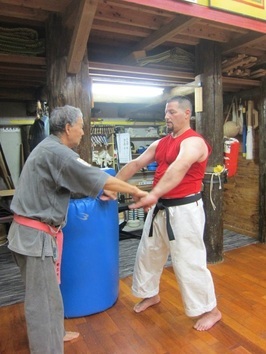 Okinawa August 2012, Receiving Shime from Hokama Tetsuhiro Sensei. 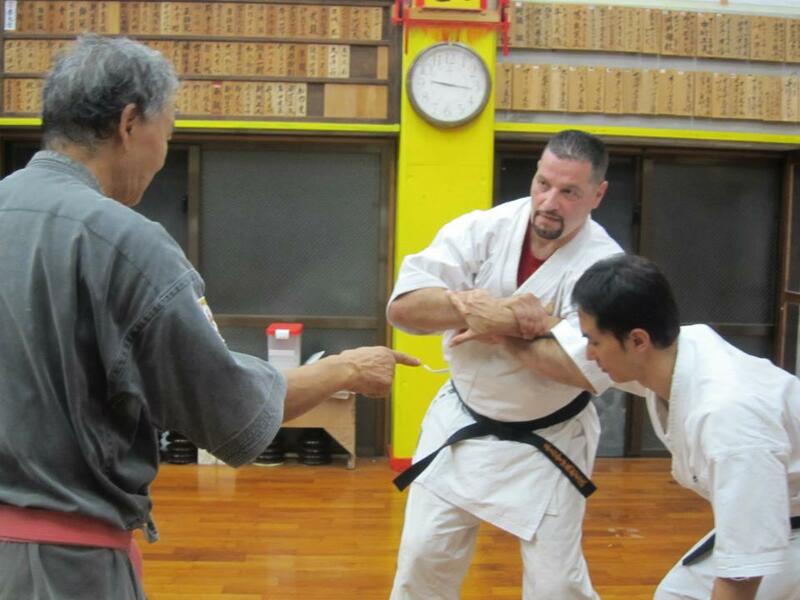 Okinawa August 2012, receiving instruction in Tuite-jutsu from Hokama Sensei. Hokama Sensei Senimar. June 8, 2014, in Kearny NJ.